In SharePoint 2010, the calendar views are rendered via a script on the client side. 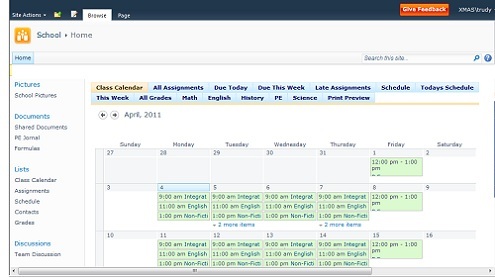 This is a significant improvement over the heavy calendars of the previous versions (2003 and 2007), and in the 2013 version client side rendering has been extended to all list views. Unfortunately, the SP 2010 calendar also came with a bug that I reported a couple years ago. It is made of two layers – one for the grid and one for the events – and when the calendar gets resized the two layers get out of sync. Really annoying! As far as I know, Microsoft has never fixed this. I keep receiving reports of this bug from users, especially as it occurs when calendar views are combined with the Easy Tabs. If you have to deal with this annoying behavior, here is a simple workaround: go to the Web Part settings and give the Web Part a fixed width. I am having the following issue in SharePoint 2010: when I set the chrome state of a calendar to “minimized” (under Edit Web Part > Appearance), the calendar still gets displayed on the page. This is an issue I already reported with the beta version. Recently, I also posted my question on the MSDN forum, but got no answer. The ability to minimize Web Parts is key when building dynamic interfaces. Currently this is a road block for some of my customizations, like the Easy Tabs or expand/collapse buttons. It is not the only issue I am seeing with calendars, I also experienced some weird behaviors when resizing the browser window. So, is it just me? I’d love to hear your feedback on this! This week, Mark Miller and I will be hosting our live online workshop series dedicated to calendars. Mark will start on Tuesday (“Create a SharePoint Master Calendar Solution“), and I’ll join him on Wednesday (“Add Color Coding and Tool Tips to Your SharePoint Calendars“) and Thursday (“SharePoint Calendar Resizing and Enhanced Views“). All these solutions work on wss v3 and MOSS, and don’t require any server side installation. 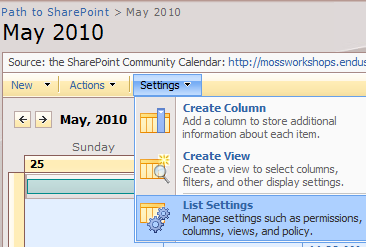 Environment: SharePoint 2007 – wss or MOSS (no SharePoint Designer or third party application required). Audience: confirmed end user, power user. 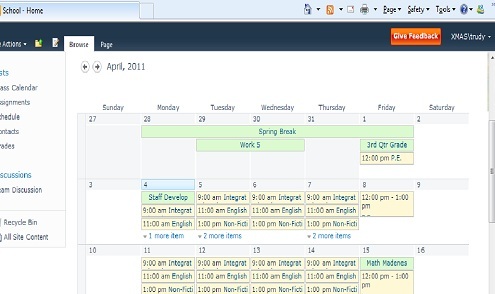 To follow this tutorial, you need a calendar created in SharePoint 2007 (wss or MOSS). I have created a choice column, called “Category”, to store these choices. Note that for this tutorial seven is the maximum number of choices. If your choice column has more options, only the first seven will be color coded. 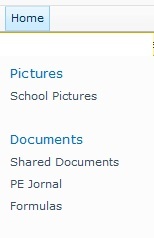 A choice column is the natural option to organize items in categories. You can also use any column type that contains text or numbers, like content type, text column, calculated column. Note that columns of type Lookup will not work for this tutorial. If your choice list includes more than seven choices, this follow up article will show you how to proceed. Note: the semi-transparent background will not be rendered in older browsers (like IE 6). After selecting your options, scroll down to the bottom of the form. You’ll see two formulas (pale-green text areas). Leave this page open or save your two formulas, we’ll use them in the next step. Note: you can choose to group the two formulas into one by unchecking the “Separate Color Column” checkbox. – click on the Download tab. – right-click on the last file name TextToHTMLlite-v2.1.1.txt, and select “save target as…” to save it to your computer. – upload the file to a SharePoint library in your site or site collection. The location doesn’t matter, as long as your users have read access to the file. Note! the download section displays 4 files; pick the last one for this tutorial. – First column, named “Color”: paste the first formula. – Second column: named “Display”: paste the second formula. Staying on the settings page, under Views, click on your calendar view. In the settings page, choose to display the “Display” column. Save your changes. Don’t worry, we are going to fix this in step 4. – under content link, paste the URL of your TextToHTMLlite-v2.1.1.txt file (remember, you stored it in a document library in step 1). If you now exit the edit mode, you should see your calendar in color. – go to the view settings page and replace Display with Title as the displayed column. – delete the two calculated columns. In SharePoint 2010, the script from step 4 will not work because calendars are rendered asynchronously. Alternate options can be found in this post. The article also mentions a resizing issue, which AFAIK is linked to the default calendar, not to color coding. Check out Brendan’s article for more information! 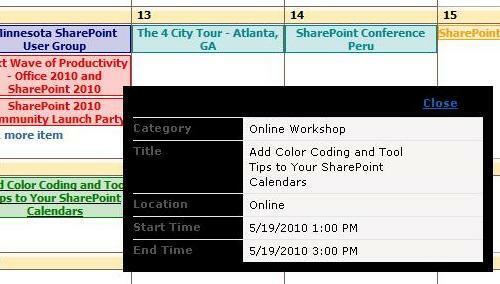 Today I decided to test my color coding tool on Mark Miller’s excellent SharePoint Community Calendar. I borrowed a slice (the month of May) and applied my formulas: you can compare the original calendar with my color coded version. In the beginning of next week, I’ll publish an updated version of the tool, and a step by step tutorial. Note that the semi-transparent background effect will not work in older browsers, like Internet Explorer 6. Quick tip: in SharePoint, each list comes with a RSS feed. If you want to be notified of new events, you can subscribe to the Community Calendar’s RSS feed. Big thanks to Mark Miller and Natasha Felshman for maintaining such a useful resource!